Learn why Thai food tastes so unique. Find easy (or challenging) recipes that you like. Bookmark us. Come back. Learn more. Cook more. Khun Kasma has taught Thai cooking for over 25 years and written 2 popular cookbooks, It Rains Fishes: Legends, Traditions, and the Joys of Thai Cooking and Dancing Shrimp: Favorite Thai Recipes for Seafood . Her cooking school, which she operates with her husband, Michael, is located in their house in Oakland, California. I had the opportunity to visit Khun Kasma's advanced class, which revealed why teaching style matters. In this class students cook, learn and laugh together. After the meet and greet and a snack, the class settled down at a kitchen table discussing menu for the evening. An appetizer, two main courses, one soup and a dessert were to be put on the table. Khun Kasma went over the recipes in details, describing what needed to be done and sprinkling Thai food history in between. As soon as the last recipe was discussed, students started to put their chairs away. Everybody got really busy, pulling thing out of cabinets, pots, pans and bowls, like it was their own house. Each team of 2-3 people worked from their notes and recipes, discussing and solving problems. After several weeks of cooking beginning and intermediate, advanced class students had become good friends and knew each other really well. 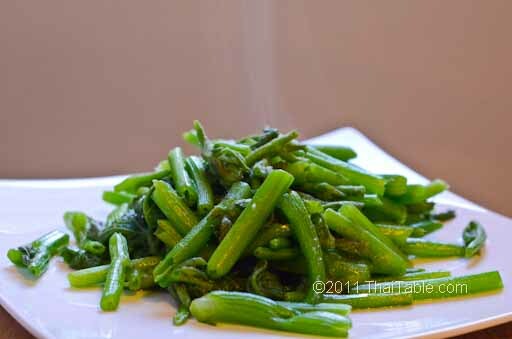 Stir fried pumpkin shoots have a great a crunchy texture with a mild flavor. I often wonder if people know what to do with all the various shoots that you find at farmer's markets like pumpkin, pea, chayote or bitter melon. Asian cuisines seem to revel in these shoots, but they're non-existent in western cuisine. For a dollar a bundle at my farmers market, I can make a great stir fried that costs $8 to $10 in a restaurant. The catch is that it requires time to prepare the shoots. The fuzz along the stems and tendrils need to be removed. I used to impatiently rush the task, but now I look forward to it, liking the meditative act of peeling away the fuzzy skin. Then I keep the shoots in the refrigerator, ready for a quick meal during the week. Pumpkin shoots are available at farmers’ markets all summer long. For a bundle that weighs a pound to a pound and a half, it will set you back 1 whole dollar. Pick bright green, plump shoots. One of the easiest dishes to prepare with pumpkin shoots is stir fry. I love Google Translations, both because it's servicable, but also because it can be simply hillarious. After seeing so many Thai green curry recipes on the net with ingredients or methods that seem to have gone through an equivalent of a translation machine, let me offer how we do it. More important, this is the most requested recipe by you, our readers. 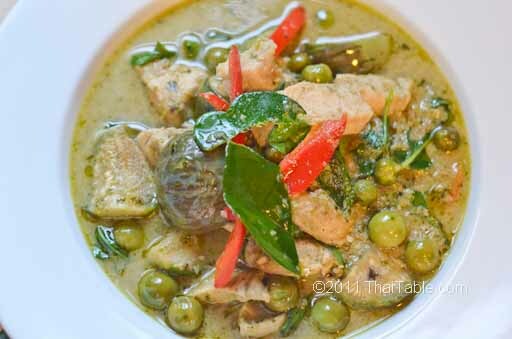 Thai green curry with chicken was a classic take-me-to-the-temple curry. Patrons would bring green curry with chicken (chicken with bones, chicken blood and gizzard) and eggplants to offer to the monks at temples. My family was not a big fan on chicken blood and gizzard, so I'll leave those out. Thai green curry is fiery hot with a hint of sweetness. The curry paste is made with fresh green Thai chili peppers. Some people even add additional whole fresh pepper to the curry before serving. 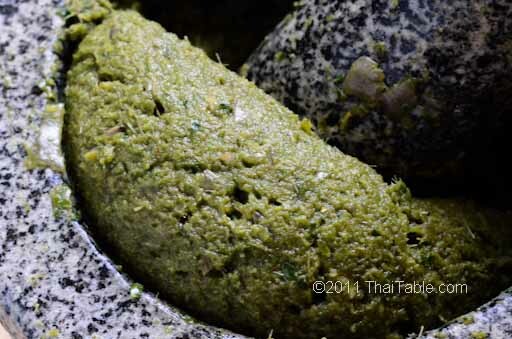 I'll stick with mild green curry, so I made my own curry paste. Even though most people living in Bangkok buy store bought curry pastes, nothing compares to the scent of the curry paste being made. It perfumes the whole kitchen. The arduous process, from sourcing the ingredients to pounding out the paste, is daunting but the reward is grand. Often store bought green curry paste is too spicy so that I can't put enough paste in without having the curry be too hot. When you make it yourself, you will be able to control the heat in your own curry paste by adjusting the amount of green chili peppers you add. 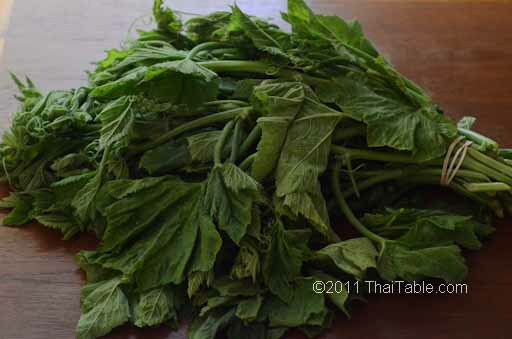 Green curry paste's ingredients are the same as red curry paste, except for the chilies. The red in red curry paste comes from dried chili peppers, while the green in green curry paste comes from fresh green chili peppers. Green chilies turn from red when ripe. Don't worry about making too much: you can store excess in your freezer for up to a year. A Thai riddle goes; when I’m a child I’m white, when I become full grown, I’m green, and when I’m old, I’m red. Green chili peppers are the young form of red chili peppers; similar to bell peppers. 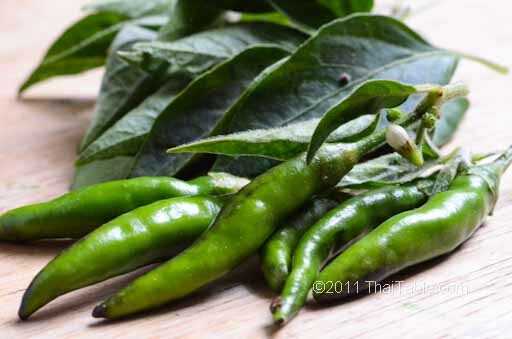 Green chili peppers are mainly used in making green curry paste. For most Thai dishes that call for chili peppers, either green or red will do. 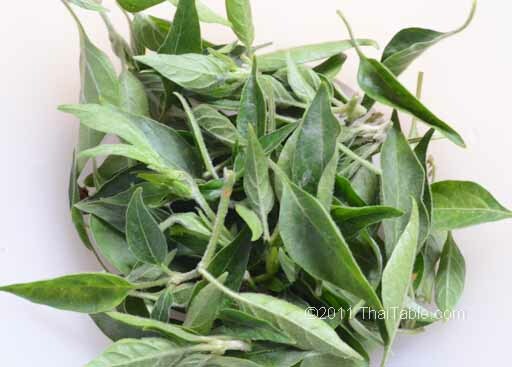 Chili Leaves don’t play an important role like galangal or kaffir lime leaves in most Thai dishes but when it comes to green curry paste, they shine. They give green curry paste its beautiful bright green color without adding so many green chilies, the curry would be too hot to eat. The leaves themselves have no heat and little flavor; they can best be thought of as natural food coloring. They are also used in many other dishes, soups and curries. It's convenient to have a chili plant, but if not, Asian farmers at farmers markets have just about the whole plant (chili with leaves attached on the branches) available mid to late summer. I pick off the leaves for my green curry paste then wash and freeze the rest of the chilies. It has been about a week now that those beautiful sardines have been packed in salt. Looking at the brownish juice that came out of the fish, I can see the precursor to the fish sauce. I have to open the lid to add the next ingredient but don't want to -- will I get worst smell of rotten fish? Surprise, surprise, it smells good, similar to anchovies in a can. The basics of fish sauce ingredients are fish and salt. 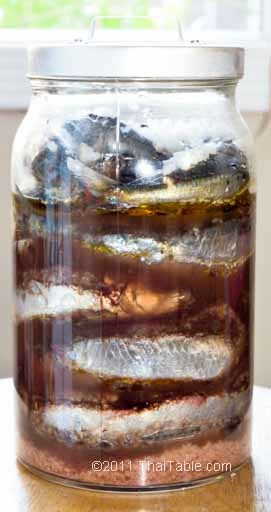 Many people add more ingredients to create their own signature on fish sauce. I have heard some people put cattle bones in. Commercial manufacturers normally add sugar. My mother likes pineapple in hers. She said, 'The pineapple will give the fish sauce beautiful reddish brown color. It also gives the wonderful fragrance.' Pineapple contains an enzyme that breaks down proteins. Sounds good to me. So, 'rind and all', per my mother, goes into the jars. 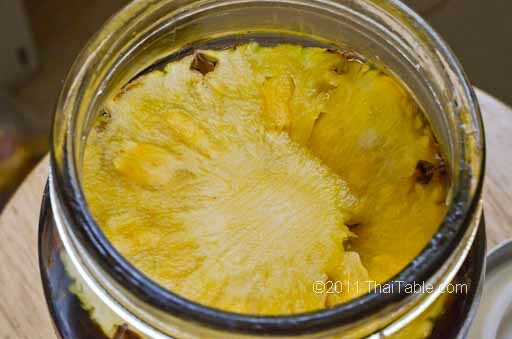 I slosh the jars around to get the juice to cover the pineapple. The mixture of pineapple scent and fish smells great. At Bo.lan, the chefs will pleasurably force you to focus on the moment by nailing you in your seat, pulling you into the dinner with your tongue, and flying you from one height and experience to the next. Knowing even a little Thai food history, you quickly recognize that your trip goes not only from flavor extreme to another, but north to south, street to palace, ancient historic food to childhood to now. If you visit Bangkok, you must eat at Bo.lan. What stands Bo.lan apart from most other Thai restaurants is the care and attention they put into all they do. Their recipes and menus are selected, developed and tested after deep research. Their flavors shine because they make everything, like curry paste, from scratch. Many of their ingredients are adventuresome and unique. Bo.Lan was started by Bo Songvisava and Dylan Jones, partners in life and in kitchen with a deep love of Thai food and food history. Trained in Western cuisine, Bo became interested in Thai cooking during her stay in the UK. Dylan had already knew how to cook Thai food before he met Bo. 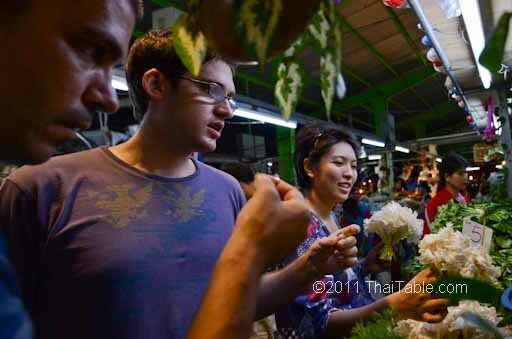 To further his knowledge in Thai cooking, he took up Thai lessons so that he could research Thai food. 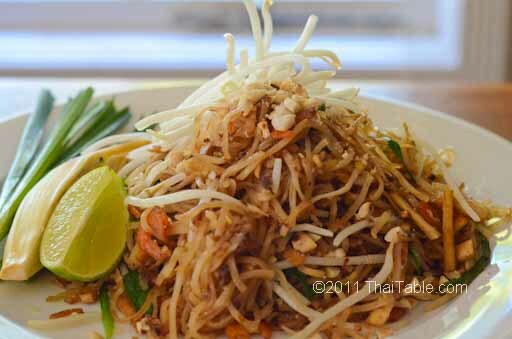 The Pad Thai most traditionally and commonly found at street stalls, food courts and open air markets, is made with dried shrimp. Competition drove many vendors to go high end by using fresh shrimp (Pad Thai goong sod). This pad Thai recipe is for the older, more traditional version. When I was growing up, my uncle was in charge of getting everybody late night snacks. He would go out to the nearest all night market and come back with everyone's orders. Mine was always Pad Thai. The pad Thai came wrapped in an old newspaper page lined with a plastic sheet. They would put extra sugar and ground chili pepper between the newspaper and plastic sheet. You don't see such make-shift food wrap anymore; now it's in a foam box. Today, there have been 10 visitors (41 hits) on this page!